Ruben Salvadori is a young Italian photographer with a BA in Anthropology from Hebrew University in Jerusalem. 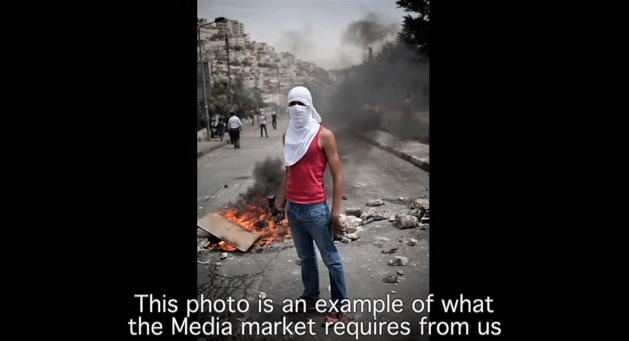 While covering the ritualized clashes between Palestinian youth and Israeli security forces, he became interested in the gap between the practice of photojournalism and the images that were shown to the public. His video, Photojournalism Behind the Scenes, turns an ethnographic eye on the photographers’ relationship with their subjects, and on how that part of the photographic encounter is edited out of the picture. 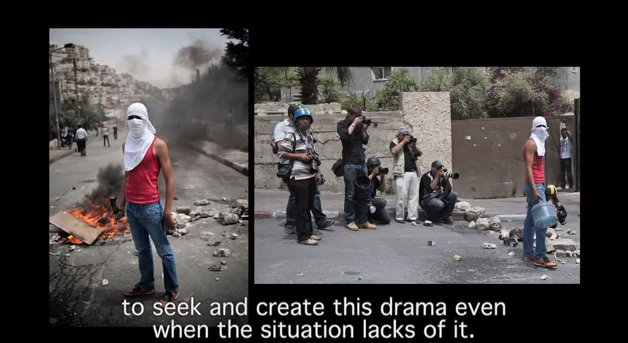 Salvadori does a fine job of exposing this tacit dimension of conflict photography. Unlike some critics, the point is not simply to trash visual media on behalf of some supposedly innocent alternative. In fact, none of us are innocent, and one might well ask how these and other representational conventions contribute to the stalemated catastrophe in Palestine. Would that we could stand back a bit further and see, not only the photographers, but how many others are all too habituated to crafting illusions of dramatic conflict, rather than achieving an equitable resolution to a political tragedy. For additional commentary, see the discussion at Planext.